It was a busy morning at the Sasha house ~ I had a 8:30 meeting so I was rushing around (BTW ~ I really don’t know HOW ya’ll do that every stinkin’ day and I have absolutely NO memory of doing the very same thing 30 years ago the 1st time around-damn!). 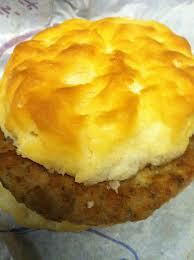 I dropped Tater off at school, then rushed through the drive-thru, grabbing my large iced tea and biscuit. I ate on the way to my appointment, finishing just before I got there. I checked my teeth, replied lipstick, wiped my hands with a baby wipe and hopped out of the car, file folder in hand. My meeting was with 2 people, a man and a woman. All went well ~ I was prepared, wow’d their socks off and felt REALLY good about the possibility of a new client. I DID notice the man staring at my chest a few times, but hey ~ the girls are big and I had on a v-neck (not a really low-cut v-neck but when the girls are big, ANY v-neck shows a little cleavage). We stood, shook hands and I asked if I could use the restroom (it was in a business, I would never ask someone in their home ~ just FYI for all ya’ll going “oooohh, someone you don’t know using your bathroom????”). When you are using your car as an office, you never pass a bathroom without checking it out ~ hell, at almost 50, I LOOK for bathrooms to use….just something all you youngin’s have to look forward to. Anywho, I use the bathroom, wash my hands, check my hair and happen to glance at my FULL self in the mirror ~ where I notice a very nice size piece of biscuit firmly lodged in my cleavage. Now, instead of feeling slightly flattered that the man MIGHT have been checking me out, I think he was just hungry….for a biscuit. Dammit. Previous Sasha’s Shop is OPEN!
! @#$%^& i wanted to see the biscuit in cleavage photo! Girl, I slapped that biscuit outta there so quick there was NO time for a picture- ha!